‘Tis the season. …Gingerbread season, that is! Gingerbread is the spice of life, especially as we get closer to Christmas and the New Year. I took a leap of faith last week and ordered some vegan almond ‘egg nog’ from one of my favorite almond milk creators. They’re local here to me in Austin Texas, and while I like the flavor of egg nog… raw egg in my drink sorta… freaks me out a little bit. So with my vegan almond milk in hand, I decided that I needed some granola to go with it. I’ve made a lot of granola lately. Most of them have been keto-friendly, grain-free, gluten-free, and the like. This one though? This one is more of a traditional oat granola. Though, it’s east enough to make it gluten-free! This granola is lightened up with using a light syrup, plenty of oats, and no sugar added. The syrup makes the granola plenty sweet and the warmth of the cinnamon, ginger, and cloves gives the hinted flavors of gingerbread. It’s a lighter take on gingerbread flavor, but I found that with the egg nog almond milk, that it was plenty enough for me! If you' want a more bold gingerbread flavor, feel free to double the spice amounts for more of a kick-in-the-pants! 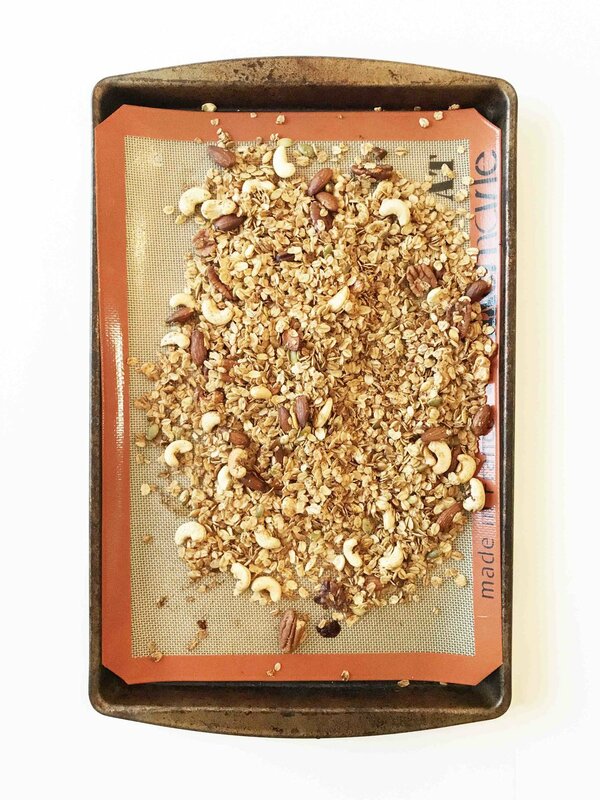 This makes a pretty decent sized batch of granola, and it stays good as long as you keep it sealed in an air-tight container and from going stale. A week at the very least! That means that it’s perfect for meal prepping or having on hand for friends and family as a breakfast or brunch option during the upcoming holidays! A festive Holiday inspired granola that's quick and easy to make. Warm spices and toasted oats. Perfect for enjoying on cold winter mornings with some eggnog and fresh fruit! Preheat the oven to 350 degrees F. and line a baking sheet or two with foil or silicone baking mats; set aside. 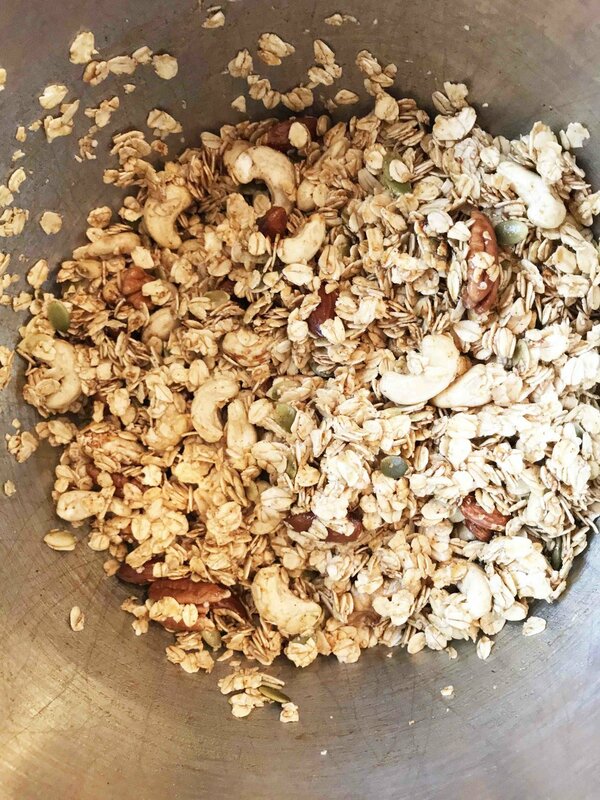 In a large bowl, stir together the 3 1/4 C. oats, 1 3/4 C. mixed nuts, 3/4 Tsp. ginger, 1/2 Tsp. cinnamon, 1/4 Tsp. salt, and pinch of cloves. Stir in the 1/4 C. coconut oil, 1/3 C. syrup, 2 Tbsp. molasses, and 1 Tsp. vanilla until everything is coated evenly. 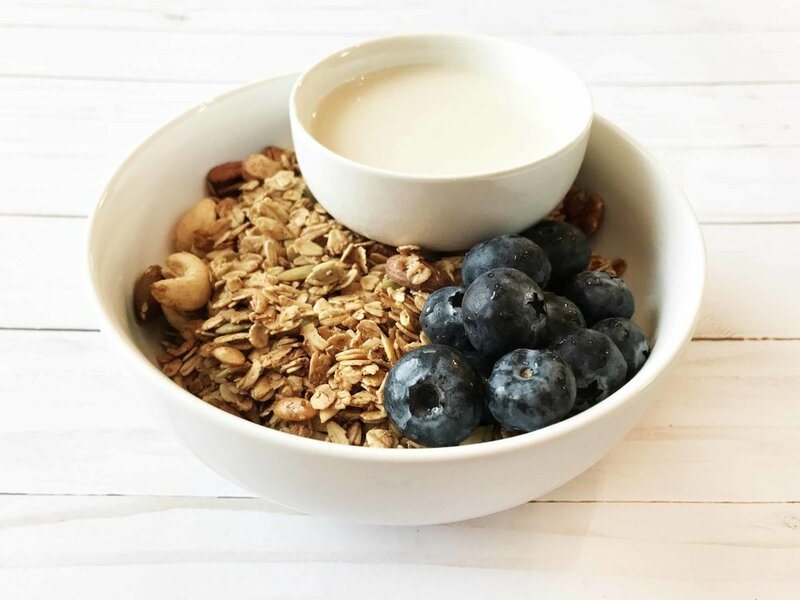 Spread the oat and nut mixture out onto the prepared baking sheets and place in the oven to bake for 20 minutes, stirring about halfway through the cooking time. Store in an airtight container for a week or two and enjoy!